Continued from Part I: I’m not sure anyone wanted to leave the cabin, but camp was broke, coffee was had, and the drivers’ meeting commenced. We were headed for a resupply stop before hitting Dante’s View for some photos, and then to camp somewhere in the valley below. We headed for Warm Springs via Butte Valley Road, playing leap frog with another group of vehicles due to frequent stops for photos, and passed some friendly looking burros (who I think may have been the same burros that were up to no good in our camp last night). Prior to hitting U.S. 190 we hopped out of the vehicles to stretch our legs, snap some pics, and air up the tires. 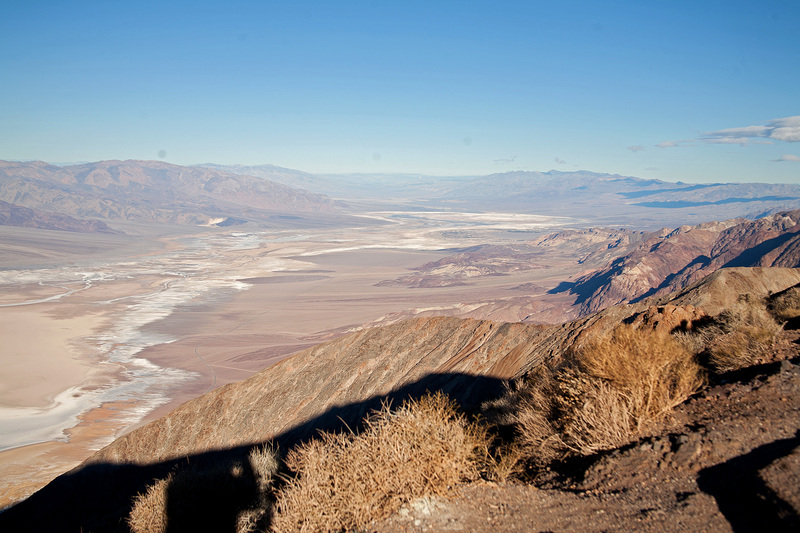 We crossed through Badwater on our way to Furnace Creek—on the main route for most tourists, Badwater was a good reminder why we choose to do the types of trips that we do, spending most of our time in the back country. At Furnace Creek we stopped for gas and any other needed supplies. The command decision was made to hit Dante’s View in the morning the following day so the sun would be in a better place for photos of the valley. It was discovered that we had cell phone reception so several had to take a moment to get their Instagram photos posted. Once everyone was resupplied we were off to find a camping spot at the base of Dante’s View. 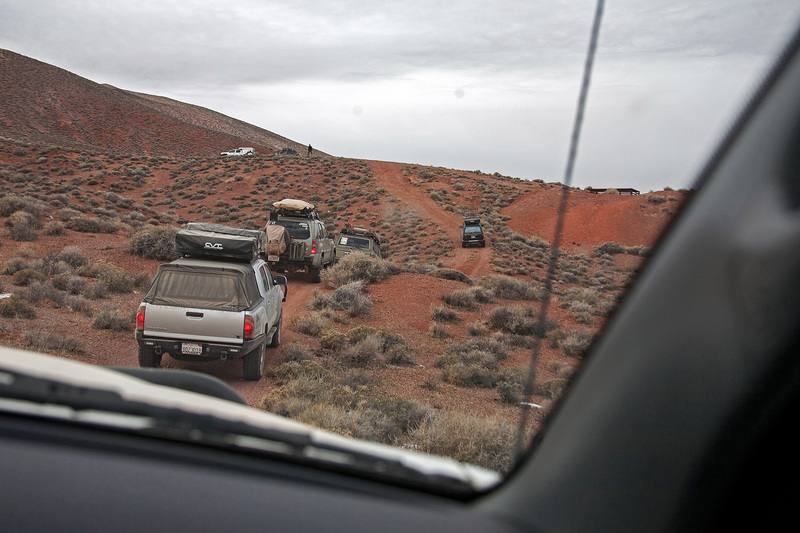 We ended up on a very small plateau above a closed down mine near the base of Dante’s View, and circled the trucks for camp far enough away from the road that we had no unexpected guests, except for the weather. A significant storm was rolling in through the valley so the priority was to get camp setup, and fast. With camp secured it was business as usual until: appetizers, cocktails, and a fire until the storm pushed us out. We prayed for snow over rain, and our prayers were answered. As we enjoyed the splendor of a light snow on the front of the storm and a fire with good friends we were granted a second gift in the form of a 15 minute long snow storm followed by clear skies and a beautiful night with great friends. 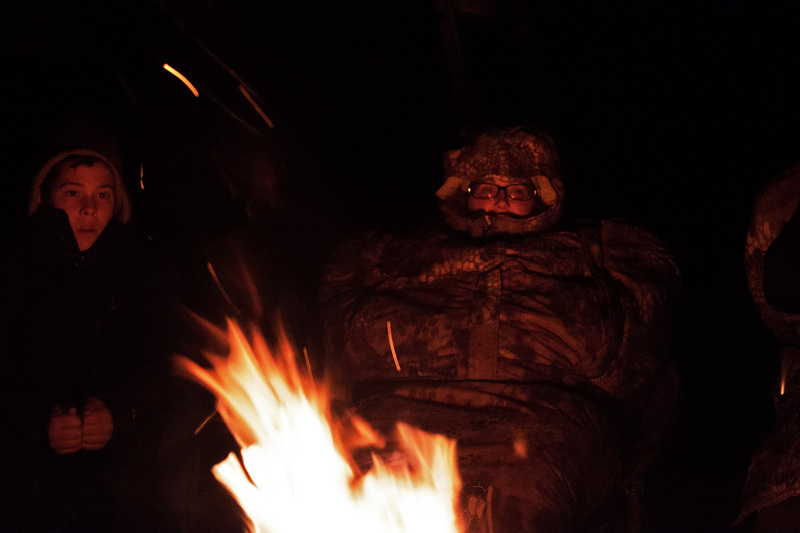 Before bed there was one last order of business: we had been breaking camp and hard charging every morning, so no one really had the opportunity to make a good breakfast. The discussion of tomorrow’s breakfast was brought up. Dave asked if everyone wanted to put a hold on the hard driving, and go sit down and have breakfast in one of the restaurants the following morning. Everyone’s eyes said the same thing: yes to a good breakfast, no to a crowded restaurant. So I brought up the idea of a tailgate breakfast somewhere convenient. We could break out the Skottle’s and all our breakfast foods we brought to cook a big community breakfast. The decision was unanimously agreed and the plan was set! 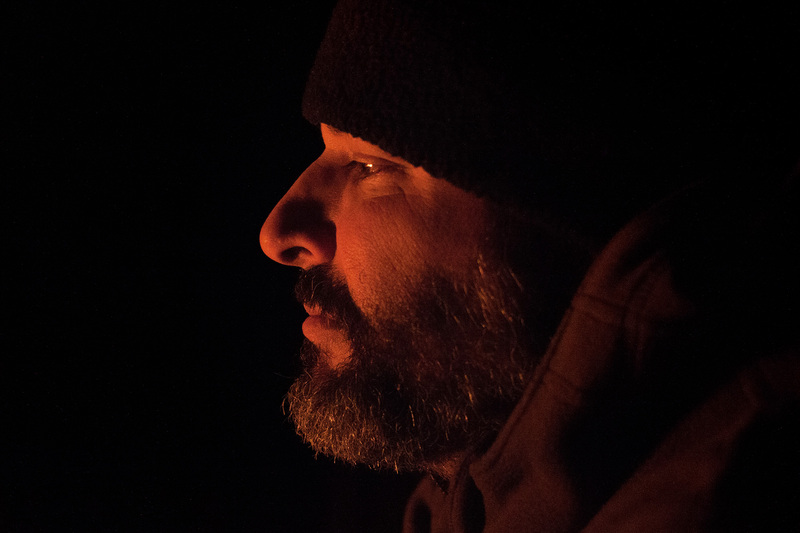 The wind howled that night, but we were all snug in our tents and bags. After a good night’s sleep we woke to coffee and tearing down camp. 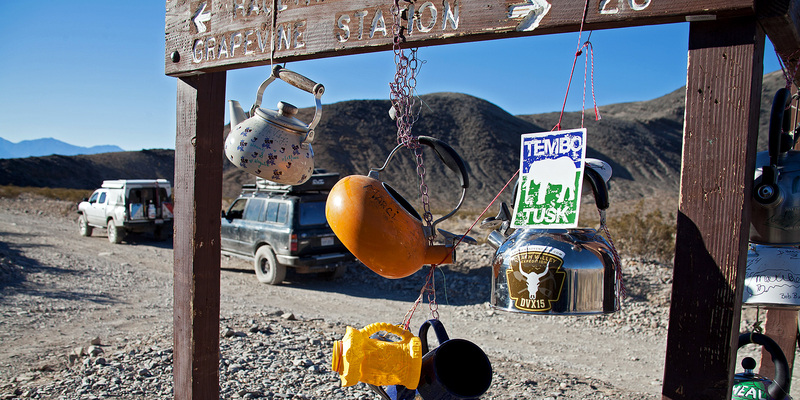 For the most part, anyone who didn’t already have a system in place for breaking down camp at the start of the trip, was now a well-oiled machine. Camp was broke quickly which gave us time to enjoy our coffee and chat a little before we confirmed the daily plan at the drivers’ meeting. First off was the climb to Dante’s View, which was a paved winding road. When we made the peak the wind made the previous night’s wind look like a slight breeze. Everyone got out and looked around to check out the view. Some of the braver souls stayed and took pics while others took the time to sit in their vehicles out of the wind and reflect on the trip so far. 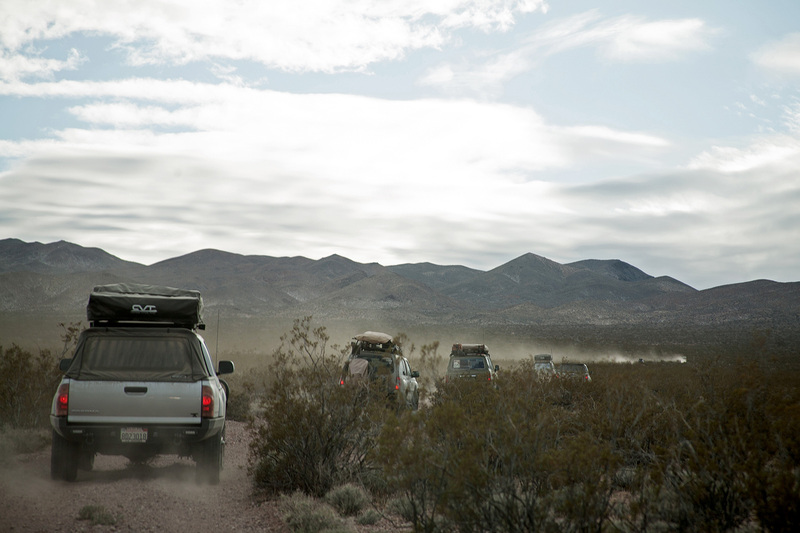 From there we headed to Stovepipe to resupply and then on to Mesquite Dunes for breakfast. Mesquite Dunes is on the main highway that runs through Death Valley, and has a large parking lot capable of parking trucks, trailers, and RVs. When we arrived we were able to take two of the RV parking spots with 4 of our vehicles. We set up the cooking tables and Skottle’s between the vehicles and the cooking began. Everyone pitched in what breakfast items they had, leaving themselves enough for the last morning. Richard and Jacki jumped in and started preparing the food as Cris and I cooked. This was my first experience with the Skottle, to say I was impressed would be an understatement. I had a ton of questions about it, such as what can’t be cooked on it, how small does it pack down, and the biggest question being: how hard is it to clean. After cooking hash on it and of course burning some to the grill I got to see just how easy it was to clean. We heated it up and just scraped the layer of burned on hash with ease. Right then and there I decided I would be purchasing one once we got home. After breakfast, everyone was able to take some time and enjoy the dunes. Our next destination was Ubehebe crater but before we made that move Brian, Aislinn, and Garrick broke from the group and headed for home. They would later be followed by Matt and Cody. 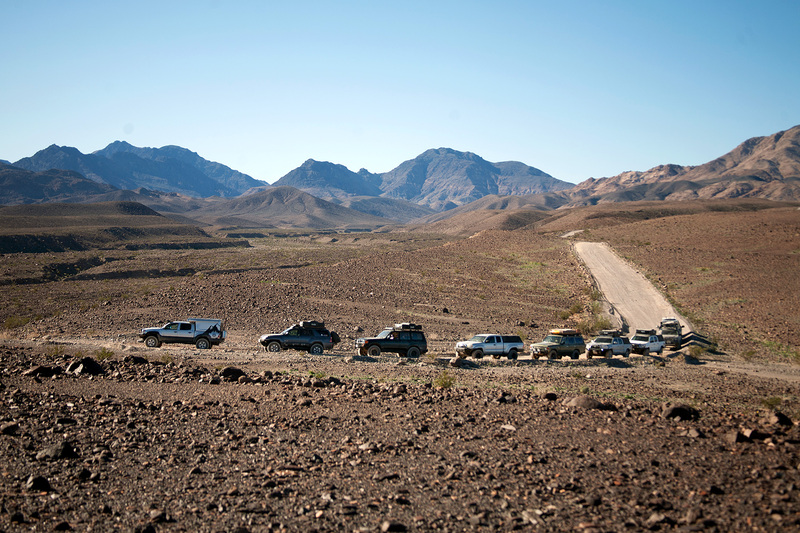 The drive to Ubehebe crater was an easy drive on a paved road with a proper parking lot. 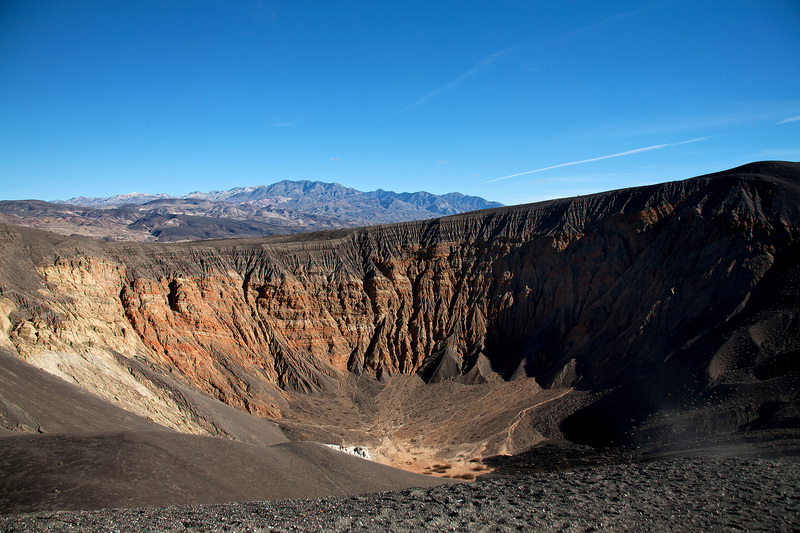 Ubehebe crater is a 600 foot volcanic crater that’s approximately ½ a mile across, and named after Ubehebe Peak 24 miles southwest of the crater. It is unclear why it was named for a peak so far away, and many mistakenly think its name means big basket. The crater is a maar—created by a combination of hot magma hitting water and creating steam, which expands and explodes releasing the pressure. From the crater we headed out to the Racetrack on one of the worst washboard roads I’ve been on in the Tacoma. Airing down helped significantly but it was still bad, which made arriving at racetrack that much more satisfying. 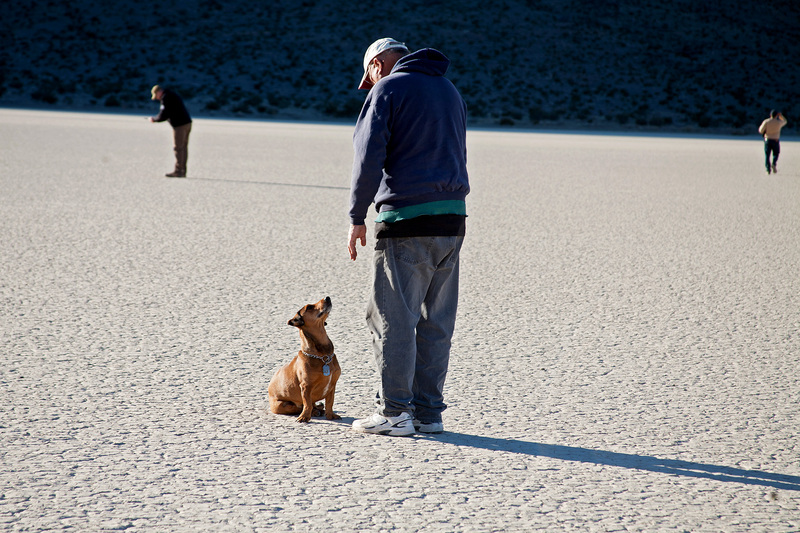 Racetrack Playa is a valley that has been wrapped in mystery, it is a dry lakebed known for its strange moving rocks. Sometimes these rocks are called sailing rocks, the rocks leave a long track behind them as evidence that they moved. After parking we walked out to the Grandstand, or as some call them, the islands. The Grandstand is a large picturesque outcropping of rocks in the middle of the playa. A handful of us climbed the Grandstand for a better view. 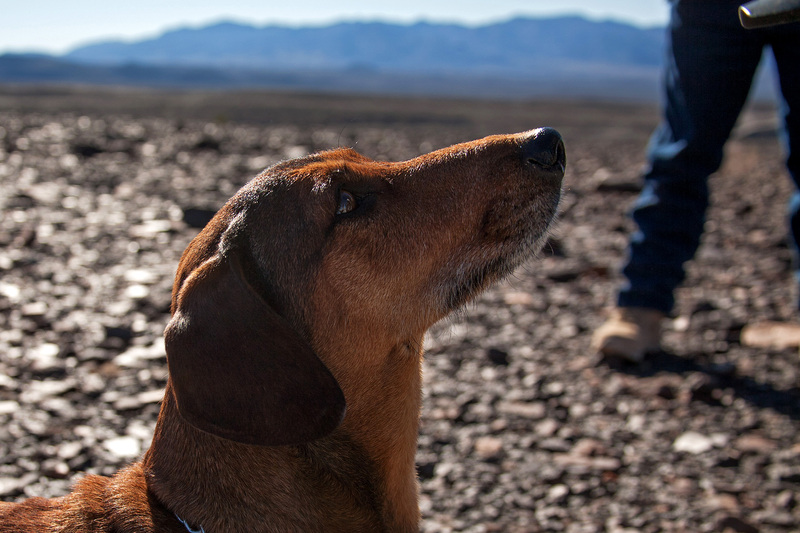 We discovered something amazing on the grandstand: Henry the World’s Largest Dachshund was a great climber. Granted we had to carry him back down part of the way, everyone knows heading down is always more difficult than going up. We said our farewells to Matt and Cody, then the rest of us headed for Homestake Dry Camp for the night. Once camp was setup and the fire was started we could tell we would be in for another cold night. Jerry broke out the night’s appetizers in the form of pot stickers cooked on the Skottle, and moonshine. 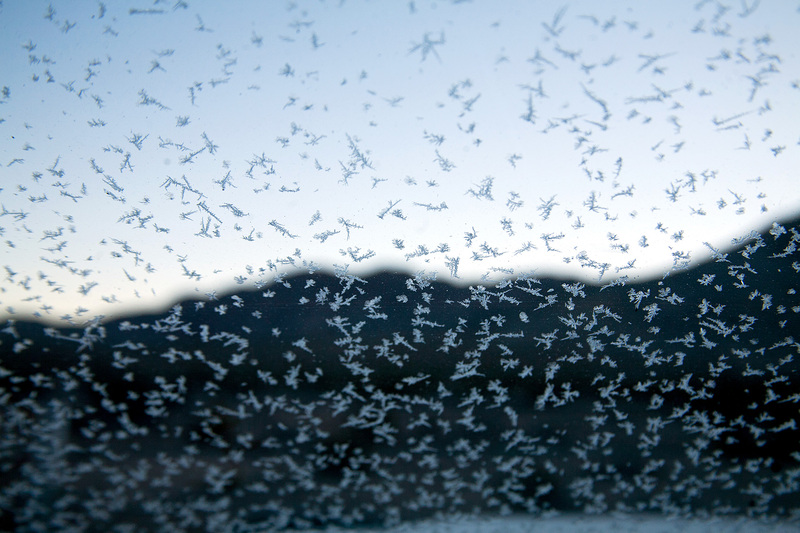 That night was the coldest night we had with temperatures into the single digits. In the morning we woke to ice on the windshields and tents, so a morning fire was started and a big breakfast was made with coffee for all. At 9am it was still only 16 degrees. 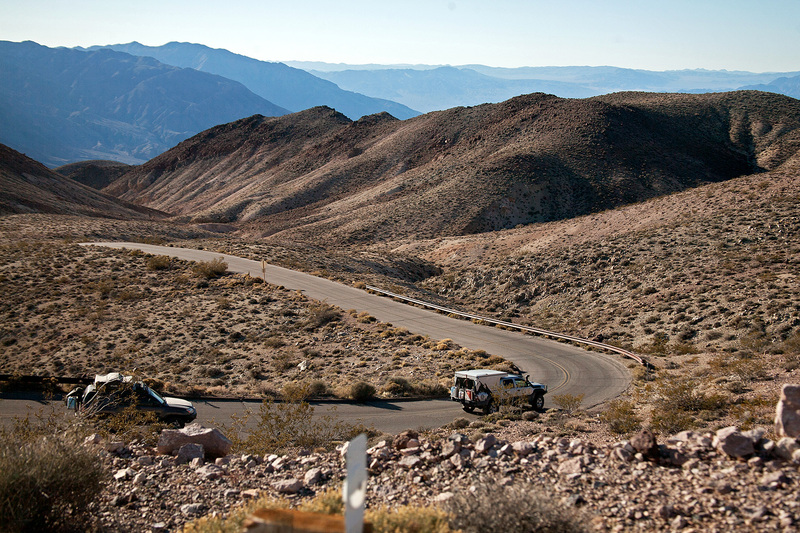 Lippincott Mine Road is a narrow shelf road from the Lippincott Mine down to Saline Valley. It should only be run by vehicles with four wheel drive that have the ability to recover themselves (or be recovered by others in your party). 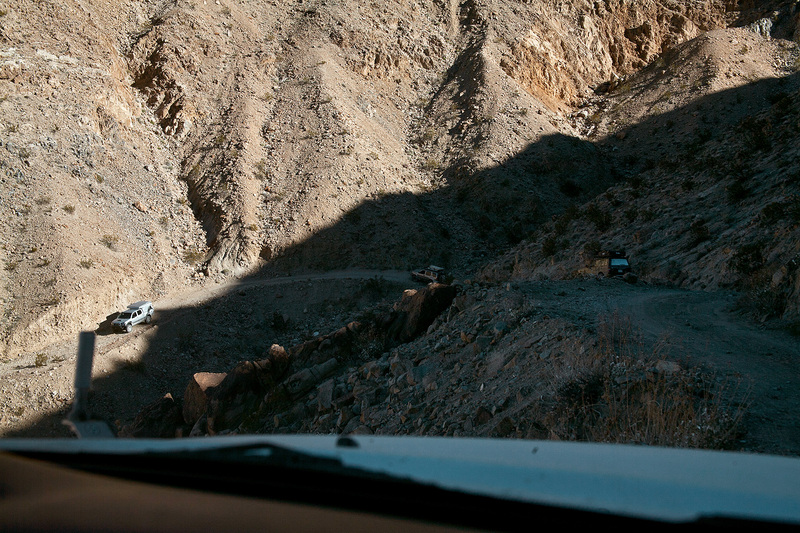 It has been rated as one of the more dangerous roads and is considered the most difficult wheeling road in Death Valley. 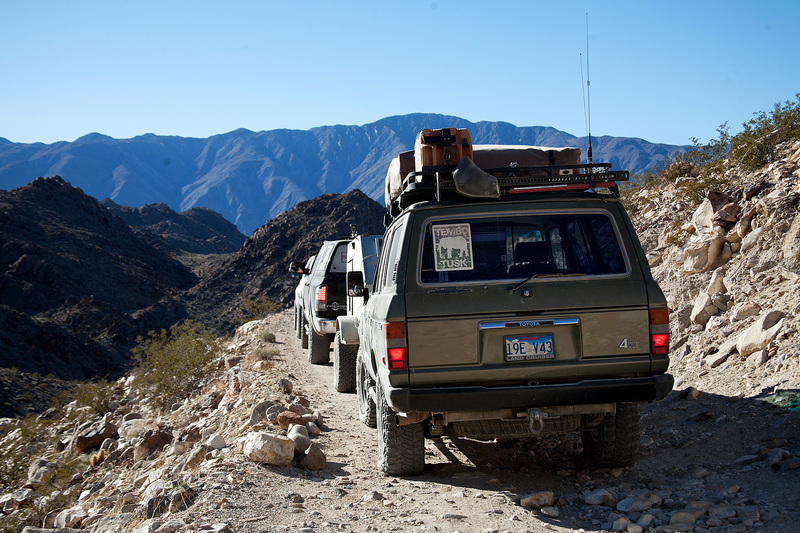 In our group we had three Toyota Tacomas, a Land Cruiser FJ60 and FJ80, a Nissan Xterra, and the infamous BlkWgn (a Dodge Power Wagon pulling a small off road teardrop trailer). Dave put the FJ60 with his winch behind the Power Wagon for recovery purposes, and we ensured that every second vehicle had a winch for the same reason. Much to our surprise the road was in very good shape and only had a couple narrow spots, which Cris made look easy. I personally have never seen Cris not be able to drive the Power Wagon anywhere we take the Tacoma, and Dave who has wheeled with Cris a lot more than I stated the same thing. 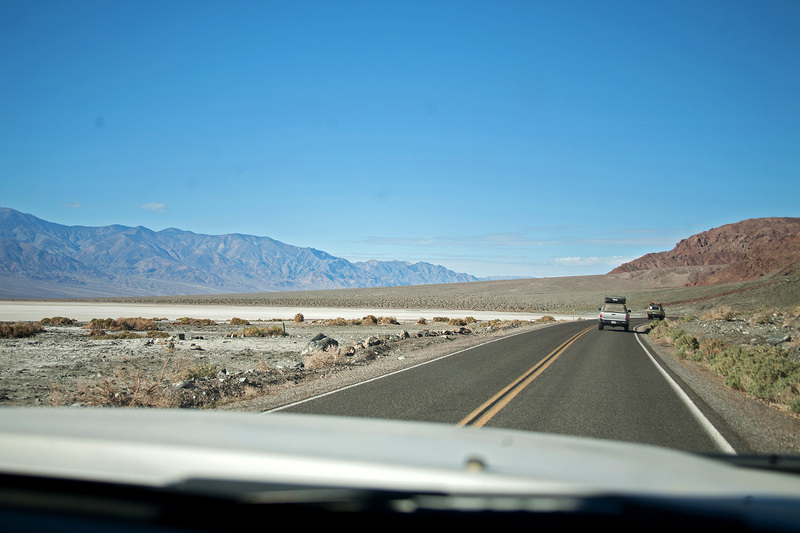 Once down the hill we entered Saline Valley and headed back to U.S. 190, where we aired up and drove to Olancha for fuel before heading home. 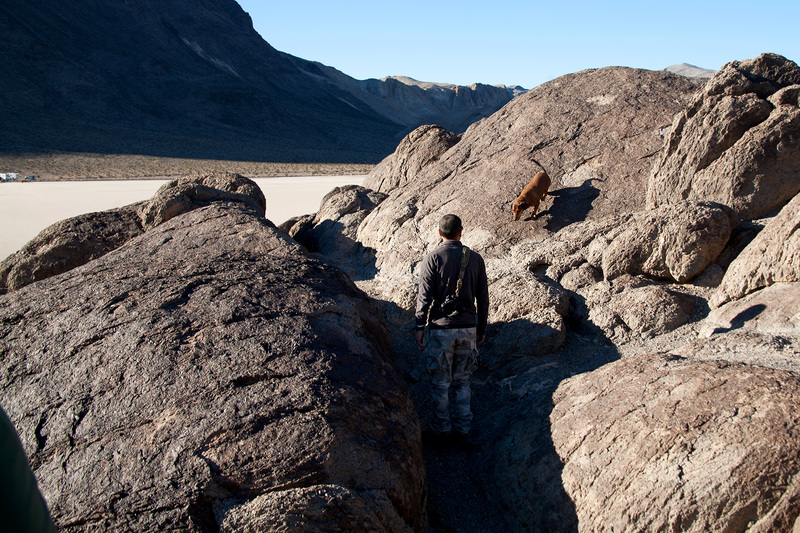 Like most adventures, this one started as an idea that was properly planned out and executed. It just requires the right people to take that step, to take an idea and put it into play. We had some very experienced individuals on this trip along with some very new adventurers. This trip was by no means an easy trip with the extreme cold and the long days of travel from point to point. 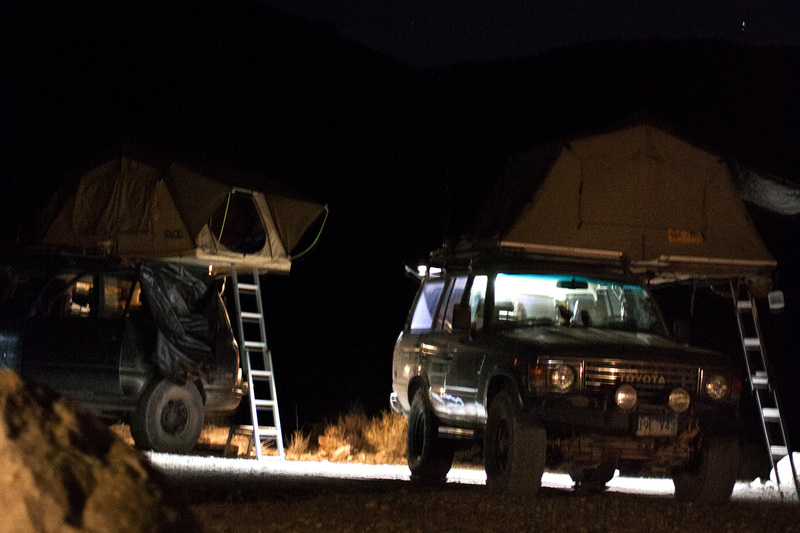 We had survived five days in the infamous Death Valley, seeing some great landscapes and picturesque night skies. I am looking forward to more adventures with a group of people I am proud to call friends.